The article is about ancient times of Armenia. This is helpful information for travelers who want to travel to Armenia. Armenia is among sites of earliest life. Evidence of prehistoric humankind have been found in caves and open air settlements here. From 9-7 BC on the territory of Armenia was established one of the most powerful empires of the ancient world, the Urartian, or Van Kingdom, noted for its canonized architectural principles and proportional systems of separate buildings. The first cities with systemized layouts and landscape terra-forming features started to emerge (Erebuni, Teyshebaini, Tushpa, Argishtikhinili, etc.). The arts of jewelry, ceramics, armory forging, stone and bronze sculpture reached utmost development. The Kingdom of Armenia enjoyed its most powerful world influence in the 1st century BC under the reign of Tigran the Great. The wise and powerful leader built a strong state which started to compete in this region with the Roman Empire. But the Romans’ second effort, led by Pompeus, successfully took part of Armenia. But, conceding to the stubborn resistance of the Armenian Highlanders, Rome gave up the notion of making another empire province. Instead, Emperor Nero invited Armenian King Trdat the First to Rome and officially inaugurated him King of Armenia. Armenia kept her independence, but under the patronage of the Roman Empire. The emerging of Christianity was another crucial event in the history of Armenia. Two disciples of Christ, Thaddeus and Bartholomew, were the first Christians that came to Armenia, bringing with them relics of Christ’s crucifixion and the gospel of the new ideology. 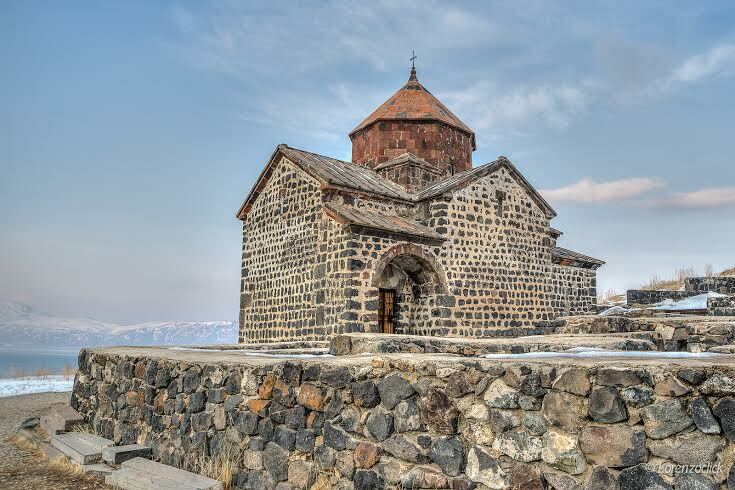 In 301 A.D. Armenia became the first country in the world to adopt Christianity as the official religion of the state. For Armenian culture the adoption of Christianity has had a unique significance. In order to immortalize and advocate the new ideology a principally new culture was developed: Quadrate temples decorated with biblical scenes, cross-stones, church architecture. Then, in 404 A.D. MesropMashtots, a Christian priest, created the Armenian alphabet, which remains unchanged to this day. With the written word came the translation of the Bible, historic, spiritual, philosophical and scientific works, colorfully illustrated in the first examples of miniature painting. In 428 AD the Armenian Arshakunian Dynasty collapsed and Armenia became a semi-independent state under the dominion of Sassanian Iran (481-640). In this period a new form of church architecture was developed – churches with cross-like layouts and central domes. In 640 Armenia was conquered by the Arabian Caliphate. It regained independence in the 9th centuryand until 1045 was united under the Bagratunyan Dynasty. The capital city of Armenia was Ani with a population of around 100,000 that became one of the biggest trade and handcraft centers of the Middle East. Exclusive development was achieved in the spheres of architecture, in particular church construction. Ani was called a city of 1001 churches. In 1071 after the Manazkert battle together with a number of eastern territories of the Byzantine Empire Armenia also appeared under the control of the Turk Seljuk reign. In a period known as the Armenian Renaissance (10th to13th centuries) the Zakaryan family united Armenia and Georgia under one power. Under Zakaryan reign the economic and spiritual renaissance gave impetus for a new wave of development in architecture. The construction of powerful castles and monastery complexes included almost the whole territory of historic Armenia. Miniature painting, literature, spiritual music, classical architecture and the art of cross-stone carving continued to develop even in the period of Mongolian power. From the middle of the 14th century Armenia was conquered by a number of nomadic tribes and lost its independence and its chance to further develop its spiritual and cultural communities. But in the middle of the 17th century there was a visible revival in architecture and in creating frescoes and manuscripts. In the first quarter of the 19th century the north-eastern parts of Armenia were joined to the Russian Empire. Though the Russian Empire itself wasn’t a democratic country and rights of colonized nations were not respected, nevertheless it was much better than life under Ottoman rule. So Armenians living in Western Armenia were envying the destiny of Eastern Armenians. This notion contributed to the worst tragedy in the history of Armenia. During the First World War a well-planned genocide was organized and accomplished by Ottoman Turkey on the territory of the whole historic Armenia currently within the boundaries of Turkey. The Armenian population was completely annihilated or expelled, and historic cultural valuables were methodically destroyed. At the end of The First Word War both empires – Ottoman and Russian collapsed. In 1918 the Republic of Armenia was established. This new Republic immediately joined the Antante. The Paris Peace Treaty restored the sovereignty of Armenians on the territory of East Armenia and part of West Armenia with a free access to sea. Take a Christian Tour to Armenia and experience the culture and people.